As has happened before, I did not know who would be today’s pie recipient when my day began. I had some ideas, but I was not certain. Instead of rushing things I decided to spend some time tending to the raised bed in my yard. I can’t really call it a garden because I haven’t managed to grow anything there for a few years. In the past I have had some success with tomatoes and so today I spent a few hours preparing the soil for planting. While I was working, I thought of my son’s upcoming graduation and realized that I did not know if he had arranged for a cap and gown. I went inside and called Ashland High School and spoke with Callie about the possibility of securing a gown at the last minute. Callie did not seem in the least bit concerned or put out. She told me that there were caps and gowns still available at the office. There was not a hint of “so your child is graduating next week and just now you are thinking about getting a cap and gown?” If you hadn’t already guessed, I decided right then to make Callie a pie. I first got to know Callie because she worked in the attendance office and when my kids missed a class for one reason or another, I would get a message from her on my answering machine. It was nice to get that call. And most of the time I was able to call Callie and explain where my child had been. I liked that they knew that someone other than me was keeping tabs on them. Callie has served the Ashland School District for a long time. She has been an incredible champion for the classified employees of the district and she has also been a great friend to the students. The few occasions that I visited her office, I found it filled with kids. I think that says a lot about Callie – that teenagers are comfortable around her. 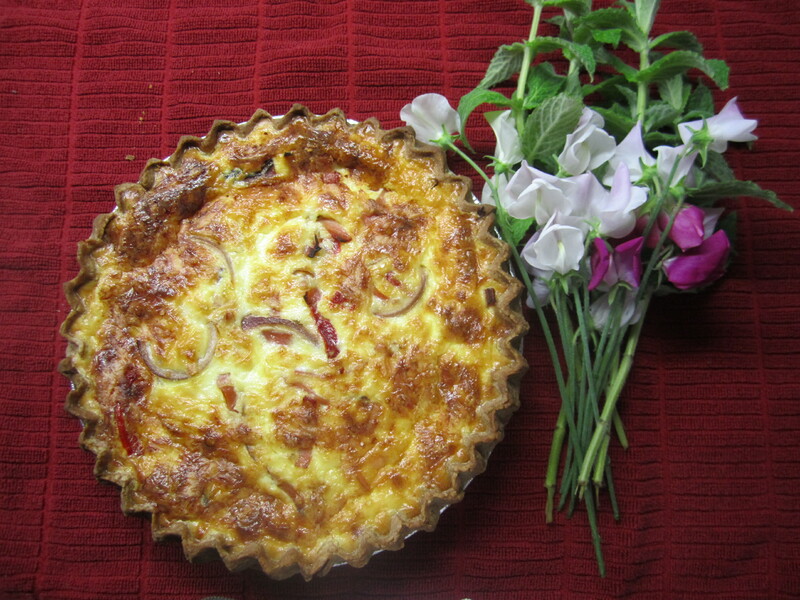 Today I made a quiche to thank Callie for all that she has done for Ashland. She is a calm presence; always willing to help and support our kids. We are so lucky to have her.